The US national space agency, NASA, said it was too early to draw any conclusions on causes of August’s air leak from the International Space Station before samples obtained during a Russian spacewalk are examined on the ground. "Today’s Russian spacewalk with cosmonauts Oleg Kononenko and Sergey Prokopyev was conducted to inspect and collect samples and photograph the surface of the Soyuz MS-09 Habitation Module. The spacewalk was strictly designed to gather additional engineering data for Russian specialists on Earth for future analysis of potential causes for the source of the leak," NASA spokesperson Cheryl Warner told TASS. "It will take time for the analysis of the material returned from the spacewalk to be completed." "As visual indications alone are not sufficient to draw major conclusions, it would not be appropriate to speculate on results from the spacewalk until the ground analysis is complete," she added. Russian cosmonauts Oleg Kononenko and Sergei Prokofyev were expected to spend six hours and 31 minutes in space, but completed their spacewalk more than an hour behind schedule. The spacewalk’s main task was to inspect the hole on the external surface of the habitation module of the Soyuz MS-09 spacecraft, which led to a drop in air pressure on board the International Space Station on August 30. The Russian cosmonauts unsealed thermal insulation and the meteorite shield in the spot determined by the crew as lacking air tightness and examined the area for signs of sealant. The hole had to be examined in space, because it is located in the section of the spacecraft that would separate during the reentry and burn in the atmosphere, making further investigation impossible. It was the first time in the history of cosmonautics when the meteorite shield was opened during a space flight. Tuesday’s spacewalk has failed to establish with certainty whether the hole, which caused a pressure leak from the International Space Station (ISS) in August, was drilled on the ground or during the flight, the head of Russia’s space agency Roscosmos told TASS on Wednesday. Dmitry Rogozin was asked whether unidentified traces, which Russian cosmonauts Oleg Kononenko and Sergei Prokofyev found on the outer side of the hull during their spacewalk, support the theory that the hole was sealed from the outside, and, therefore, the spacecraft’s hull was damaged before the flight. "No, not at all," he replied. "It could either be [traces of] the sealant used to patch the hole when the leak began, or the one applied from the outside. The samples will be sent for chemical analysis when the spacecraft returns to the Earth on December 20." "There is one thing we can say for sure - the samples necessary to answer the main question have been collected," the official added. In an interview with New York Times, published when the spacewalk was under way on Tuesday, Rogozin said that the damage to the spacecraft was most likely a deliberate action. "It was intentional damage to the ship, we are convinced of this now," the Russian space official was quoted as saying. "This was intentional action; manual, intentional action." Shortly after, experts on the ground came to the conclusion that the hole was drilled from the inside of the spacecraft. It is yet unclear whether it was damaged on the ground or by someone from the ISS crew. In both cases, neither a deliberate action nor accidental damage has yet been ruled out. Expedition 57 flight engineers Oleg Kononenko and Sergey Prokopyev of the Russian federal space agency Roscosmos conducted the 7-hour and 45-minute spacewalk. The two cosmonauts worked on the exterior of the Russian Soyuz MS-09 spacecraft, where the space station’s crew had earlier found and repaired the leak from the inside. On Aug. 29, flight controllers monitoring the space station’s systems from the ground first noticed a small loss of cabin pressure aboard the orbiting laboratory. The then-Expedition 56 crew, including Prokopyev, Alexander Gerst of the European Space Agency (ESA) and Serena Auñón-Chancellor of NASA, were able to trace the leak back to a 0.1-inch (2 millimeters) hole in the orbital compartment of the Soyuz MS-09 spacecraft, which was docked to the Rassvet module on the Russian segment of the space station. After consulting with both Russian and U.S. flight controllers, Prokopyev applied an epoxy to a gauze wipe and used it to plug the hole. 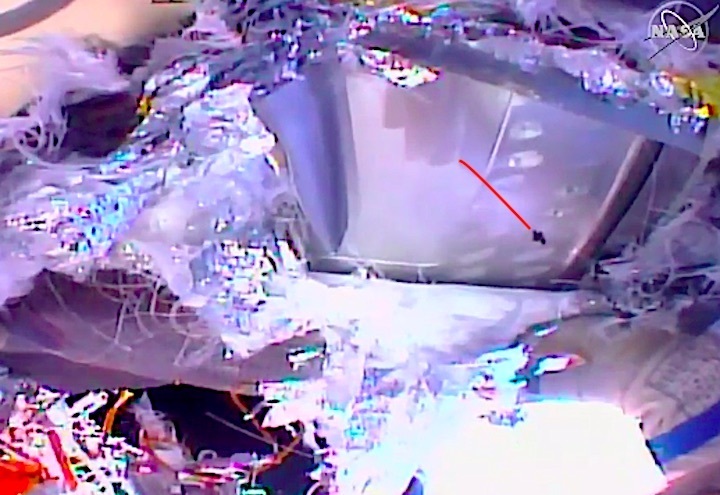 The repair halted the leak, and the space station has since maintained a steady pressure. Today, Prokopyev joined Kononenko on a spacewalk to inspect the repair area from the outside in an effort to discover what caused the leak and to collect a sample of the epoxy that had extruded through the hole from the inside. To reach the area needed to perform the inspection, Kononenko rode at the end of two Russian Strela booms, translating from the Pirs docking compartment where the spacewalk began to the Zarya functional cargo block (FGB) and then up alongside the Soyuz. Prokopyev controlled the booms’ motion from the opposite end, moving Kononenko into place, before shimmying up the second boom himself. At the worksite, Kononenko and Prokopyev took turns using a knife and a pair of long-arm scissors to stab at and cut away layers of brown, gold and silvery insulation. As they cut into the spacecraft, small fragments of the material floated away and formed a cloud of debris. 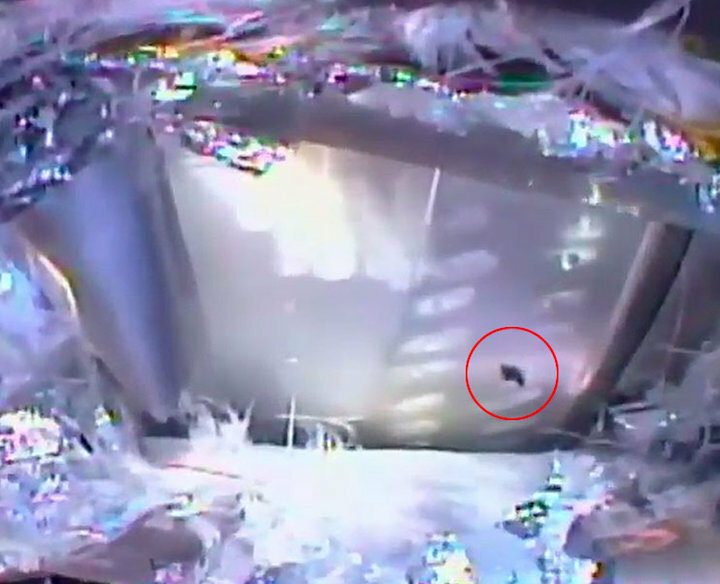 The two cosmonauts then used the same tools to cut into and peel away a thin metal orbital debris shield to expose the hole in the Soyuz MS-09’s orbital compartment. "That is exactly the hole we’ve been looking for," reported Kononenko after peeling back more of the foil insulation and metal layers that were hiding it. Kononenko used a pair of forceps and a swab to collect samples of the dark epoxy. The residue, stowed inside a bag, was brought back inside the space station and will be returned to Earth for analysis. With the spacewalk running long on time, flight controllers decided to forgo having Kononenko and Prokopyev install a replacement insulation blanket over the spacecraft’s exposed skin. The orbital compartment on which they worked is purposely jettisoned and destroyed during the re-entry of the Soyuz descent module into Earth’s atmosphere. Tuesday’s spacewalk began at 10:59 a.m. EST (1559 GMT) and ended at 6:44 p.m. EST (2344 GMT) when the hatch to the Pirs docking compartment was closed. The extravehicular activity (EVA) was the 213th spacewalk in support of assembly and maintenance in the 20-year history of the space station. This was Kononenko’s fourth EVA and Prokopyev’s second. Kononenko has now logged a total of 26 hours and 12 minutes working in the vacuum of space, including a 2008 spacewalk when he performed similar work to what he did on today, cutting into the insulation covering the Soyuz TMA-12 spacecraft to remove a pyrotechnic device. Prokopyev now has spent 15 hours and 31 minutes on EVA. Prokopyev, Gerst and Auñón-Chancellor are scheduled to return to Earth aboard Soyuz MS-09 on Dec. 19 after 6.5 months aboard the space station. Kononenko, together with NASA astronaut Anne McClain and David Saint-Jacques of the Canadian Space Agency, will remain aboard the space station as Expedition 58 crewmembers through June. An additional three crew members, including Roscosmos cosmonaut Aleksey Ovchinin and NASA astronauts Nick Hague and Christina Hammock-Koch, are slated to launch to the station on Feb. 28.